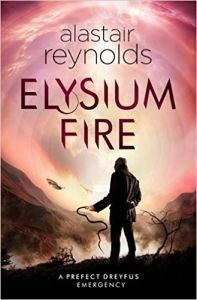 You are here: Home » MEDIA » Books » Elysium Fire by Alastair Reynolds (book review). I have found all of Alastair Reynolds’ ‘Revelation Space’ books and short stories to be wonderfully atmospheric and perpetually gripping and, out of all of them, the standalone novel ‘The Prefect’, featuring Prefect Tom Dreyfus, was my favourite. On his website, Alastair Reynolds had made a comment that he thought it unlikely that he would write another ‘Prefect Dreyfus’ novel, but I hoped that the magnetism of the character and the endlessly fascinating setting of the Glitter Band, an orbital array of ten thousand habitats, would change his mind for him. Fortunately, that very event has happened. ‘The Prefect’ has been re-issued with the title ‘Aurora Rising’ and the subtitle ‘A Prefect Dreyfus Emergency’ and the second such emergency has arrived in the form of ‘Elysium Fire’. Prefect Dreyfus is back, along with many of the supporting characters from the previous book: the more junior Prefect Thalia Ng, the hyperpig Sparver Bancal and various other operatives of their organisation, Panoply. Their aim is to maintain peace and order in the Glitter Band, but that peace is threatened by a spate of unexplained ‘wildfire’ deaths that seem to be caused by the cranial implants that are intrinsic to the operation of the systems demarchist society and also by the rabble-rousing Devon Garlin, who is agitating for the breakup of the Glitter Band and using rumours of the wildfire crisis to fuel discontent. ‘Elysium Fire’ is another multi-layered plot of a book, weaving flashbacks to Devon Garlin’s early life with the ongoing investigation by Prefect Dreyfus and his colleagues. The investigation continually uncovers further layers of mystery and unexpected turns, with slow methodical policework being interrupted by dramatic danger and ever-increasing risks. As the wildfire death toll increases, the tension rises and the book becomes continually more addictive. The background to the book has been well-established in various other novels, allowing a sense of depth and familiarity with the setting. There are lots of references to instances from ‘The Prefect’ and from the wider ‘Revelation Space’ universe, which may pass you by if you haven’t read any of those books, but these don’t distract from this new book. Alastair Reynolds doesn’t rest on his laurels, relying on previous creations, but allows further exploration of his orbiting society. There’s not so much character development this time, the backgrounds of the three main Prefects having been established in the previous book. They’re all interesting characters, each adding a different dimension and their own style to the investigation, each still proving themselves in some way. As with ‘The Prefect’, I was thoroughly engrossed from start to finish and can only hope that another emergency will call Prefect Dreyfus back to action in the future. « The Resurrection Tree And Other Stories by Tony Cooper (book review).